Previously, a top pressurized, batch style, 3.15 mL total volume water target with transparent viewing windows was operated on an IBA 18/9 cyclotron at 18 MeV proton energy and beam power up to 1.1 kW. Video recordings documented bubble formation and transport, and blue light from de-excitation of water molecules produced images of proton beam stopping geometry including location of the Bragg peak. The same methodology was applied to three additional visualization targets to examine the effect of target geometry on observed boiling phenomena. All three targets featured a wider chamber to allow for higher beam transmission and an increased chamber height, consistent with current trends in high power targets. 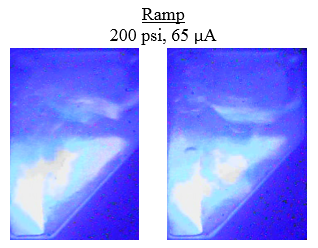 One target featured a reduced chamber depth, and another had a ramp in the back of the chamber to reduce fill volume. Target pressure was limited to a maximum of 14 bar (200 psi) due to the larger diameter beam window. The three targets were each tested at 7 bar (100 psi) and 14 bar (200 psi) for several fill volumes. For each experimental condition, the beam current was slowly increased to determine the values corresponding to the onset of boiling and to the onset of beam penetration. Each target was tested at a fill volume of roughly 1 mm above the top of the beam strike area. If beam penetration ultimately occurred due to beam passing through the overpressure bubble, the target was tested again at a slightly higher fill volume. For all of the visualization targets, a stable natural convection current was visible at all power levels, even before the onset of boiling. For higher beam currents, bubbles form in the Bragg peak region and near the surface of the beam window. Bubbles formed in these regions rapidly travel upwards due to buoyancy forces. As a result, average void fraction in the target increases with height. The increase in void fraction leads to a reduction in density and a corresponding increase in the proton range, which is exaggerated at higher beam currents. Unlike the original visualization target, disruption of the helium bubble was not observed for the new targets, most likely due to the increased chamber height. Two thermal limits were observed which result in some beam penetration in the top region of the beam. For lower fill volumes, steam accumulation in the helium overpressure bubble causes the bubble to expand into the beam region. The lower density of the bubble is insufficient to stop the beam. For higher fill volumes, proton interactions in the water lead to boiling, and excessive voiding occurs when bubbles produced in the beam region cannot rise quickly enough out of the path of the beam. The second condition corresponds to a higher total beam power. The averaged power density for each of the three visualization targets at the observed thermal limit was the same, within measurement error. At 14 bar (200 psi), the thermal limits were observed at roughly 300 W/mL, and at 7 bar (100 psi), the thermal limits were observed at roughly 270 W/mL. 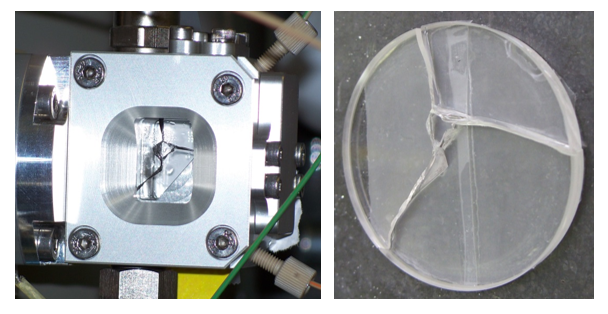 The same sapphire viewing windows were used in all four visualization targets, including six days of testing in 2012 and three days of testing in 2014. After several hours of testing with the ramp target, the front sapphire viewing window cracked, resulting in a loss of inventory. As a result, the shallow target was tested using an aluminum disk in place of the back viewing window. 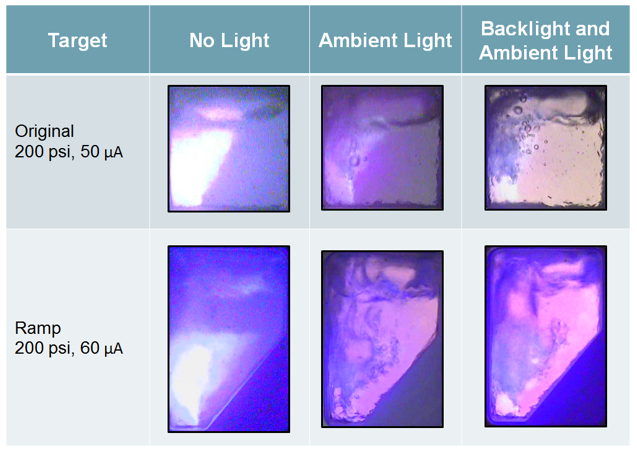 Although the backlight condition could not be achieved, natural circulation effects, boiling onset, particle range as a function of beam power and chamber height, and onset of beam penetration were still visible with a single viewing window. The cause of the break is unknown, but possible explanations include accumulated radiation damage and thermal stress. There is some evidence that the beam shifted off-center, in the direction of the broken viewing window, during operation of the ramp target. This statement is supported by asymmetric discoloration on the integral beam window and asymmetric burn marks on the back wall of the target, where beam struck the wall during the loss of inventory event. Thermal stress could be caused by the large temperature gradient on the window between the region in contact with the cool aluminum flange, at roughly 16°C (60°F), and the region in contact with the boiling water, at saturation temperature of roughly 195°C (383°F). For the new visualization targets, the increased chamber height was beneficial for vapor accumulation and for maintaining a stable internal pressure. 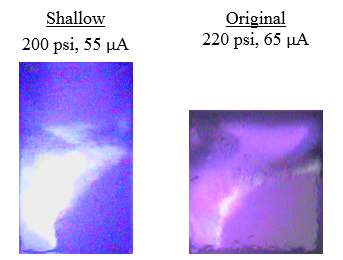 Adding additional chamber depth was shown to accommodate more voiding and higher maximum operating beam power, but did not improve the averaged power density. 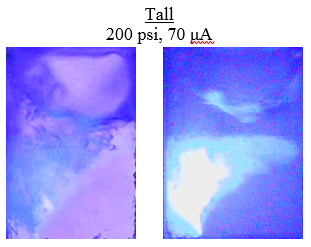 These experiments demonstrated that a small increase in the target fill volume can potentially increase the target thermal limit, by preventing beam penetration through the overpressure bubble. The averaged power density for each of the three visualization targets at the observed thermal limit was the same, within measurement error. At 14 bar (200 psi), the thermal limits were observed at roughly 300 W/mL, and at 7 bar (100 psi), the thermal limits were observed at roughly 270 W/mL. This work was partially supported by NIH (NCRR/NIBIB) Grant 1RC3RR030793-01. For additional details, please see full proceedings from WTTC15 here. J. L. Peeples, M. H. Stokely and J. M. Doster: Appl. Radiat. Isot. 69, pp. 1349-1354, 2011. S. Heselius, D. J. Schlyer and A. P. Wolf: Appl. Radiat. Isot. 40(8), pp. 663-669, 1989. B. H. Hong, T. G. Yang, I. S. Jung, Y. S. Park and H. H. Cho: Nucl. Inst. Meth. Phys. Res. A 655, pp. 103-107, 2011. J. L. Peeples, M. H. Stokely, M. C. Poorman, M. Magerl, B. W. Wieland: AIP Conf. Proc. 1509, pp. 76-80, 2012. B. H. Hong, J. Kang, I. S. Jung, H. G. Ram, Y. S. Park and H. H. Cho: Nucl. Inst. Meth. Phys. Res. A 728, pp. 6-10, 2013. M. H. Stokely, T. M. Stewart and B. W. Wieland: 120+ µA Single 18F- Target and Beam Port Upgrade for the RDS/Eclipse. In: Proceedings of the 13th International Workshop on Targetry and Target Chemistry, 056, 2010. M. H. Stokely, J. L. Peeples, M. C. Poorman, M. Magerl, T. Siemer, P. Brisard and B. W. Wieland: AIP Conf. Proc. 1509, pp. 71-75, 2012. J. M. Link, S. C. Shoner and K. A. Krohn: AIP Conf. Proc. 1509, pp. 61-65, 2012. S. Eberl, T. Eriksson, O. Svedberg, J. Norling, D. Henderson, P. Lam, T. Bourdier and M. Fulham: AIP Conf. Proc. 1509, pp. 66-70, 2012. W. Gelbart, R. R. Johnson, B. Abeysekera, L. Matei and D. Niculae: All-Metal Water Target with Spherical Window. In: Book of Abstracts for WTTC15, pp. 113-114, 2014. F. Devillet, J. M. Geets, M. Ghyoot, E. Kral, R. Mooij, B. Nactergal and M. Vosjan: High power conical-shaped Niobium targets for reliable [18F–] production and lower [18O] water consumption. In: Book of Abstracts for WTTC15, pp. 117, 2014.